Built-in microphone, simply press the one button to answer/reject/redial a call, convenience and safe to use while driving. Support mobile's A2DP function. Music will be played directly while the mobile phone is connected. And Mobile phone can be connected automatically when the device turns on with pairing mode. Support MP3/WMA from Micro SD / TF card and USB Flash Memory. It will come with car charger, output 5V-2.1A, can charger the device in car. Plug FM transmitter into car cigarette lighter, it will display the car voltage when turn on the car, and monitor car battery in any time. 1. Adjust transmitter and car radio to the same fm station to avoid noise. 3. This device is compatible with most of the mobile phones, except of a few mobile phones that are not available to use Bluetooth functions. 1. 360 DEGREE ROTATION: The FM transmitter's plated surface of process is mirror face designed with LED display. It will bring you the best visual of the car. The flexible hose design is flexible with the direction of the driver's position. It can be adjusted to the perfect viewing angle for convenient use. 2. WIDE COMPATIBILITY: It is compatible with most of mobile phones, such as iPhone, Android, Samsung, HTC, Blackberry, Sony, Xiaomi, LG, Tablet, iPad and other Bluetooth-enabled devices. 3. MULTI-FUNCTION: This FM transmitter can intelligently detect the battery voltage. It is not only a Bluetooth FM transmitter but also a car MP3 player. Listening to music is no longer limited. It will take you more fun experience. You can play MP3/WMA format music from TF card USB port or mobile phone. It supports mobile's A2DP function. Music will be played directly while it is connected to mobile phone. It also support switch music file sources. 4. FAST CHARGING AND DUAL USB PORTS: The Bluetooth FM Transmitter has two USB ports. It can make fast charging, listening songs, navigation synchronization. One USB port can be used for charging and its output is 5V/2.1A, which is available for charging handheld devices. The other can be used for reading USB files. 5. 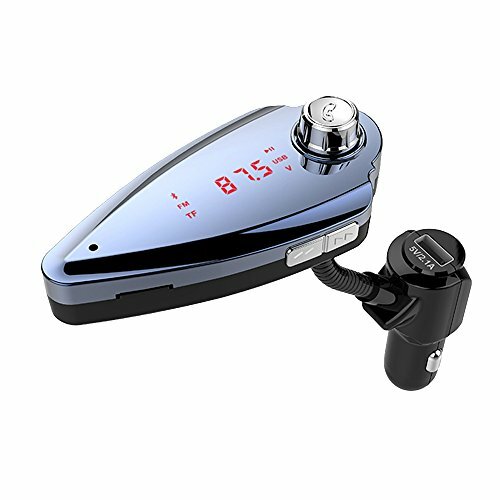 HANDS FREE CALLING AND GREAT SOUND QUALITY: Mobile phone can be simply paired with the car wireless FM Transmitter. It has one key answer function. Its built-in microphone and Bluetooth hands-free technology can make you easy and safe to answer/ hang off/reject/redial calls while you are driving. If you have any questions about this product by Nurbijar, contact us by completing and submitting the form below. If you are looking for a specif part number, please include it with your message.